A single regulator to oversee banks across all 27 European Union states could be in place as early as 2013 according to the European Commission. A controversial new bank bailout fund financed by a tax on financial institutions is also planned. The proposal includes an EU-wide deposit guarantee scheme to protect savers in the event of a bank collapse. The UK has said it would not sign up to a full banking union, suggesting it should only be for eurozone members. The BBC understands a timetable for the plan will be agreed at a European Council Meeting on 28 and 29 June in Brussels. 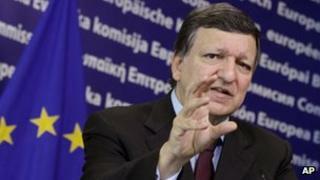 European Commission President Jose Manuel Barroso supports rapid implementation of the plan with initial provisions, such as common bank supervision, being introduced as early as January 2013. But, a commission spokesman was keen to point out that "talks between Mr Barroso and the other presidents [of the European Council, Eurogroup and European Central Bank] were in the early stages". The eurozone is as far as ever it was from a fundamental solution to its woes. He added that some elements of banking union could be achieved quite quickly without changes to existing EU treaties whilst others would be more complicated and take longer. However, a combined EU deposit guarantee scheme that required national governments to hand over large sums of money in order to insure savers against any potential bank collapse is more controversial. Germany would, as usual, be a major contributor. The vice-president of the Bundesbank warned that "comprehensive changes to EU treaties" would be needed. European banks are the biggest lenders to EU governments. The guarantee scheme would reduce banks' risk from lending to indebted governments such as Portugal. So indebted governments could benefit from artificially low borrowing costs by piggy-backing loan guarantees from Germany without addressing their underlying economic problems. For that reason, Sabine Lautenschlaeger insists that banking union should go hand-in-hand with fiscal union to ensure all EU governments adhere to strict budget policies. And that insistence could stall the whole banking union process. The commission's proposals are one step of several towards greater economic integration. Countries would lose some powers to Brussels and for that reason the UK government doesn't support an EU banking union. Germany and others are also wary about this sudden push. The German Central Bank said it would first want a full fiscal union. Germany has always stressed countries need to bring their debts down closer to German levels before it would join them in any open-ended commitment to bail each other out. A banking union is considered by most economists to be an important step in stabilising the eurozone. Such disagreements show how far Europe is from finding a comprehensive solution to its debt crisis. The commission favours banking union for all 27 EU members including the UK which is home to many of Europe's biggest banks. The BBC's Paul Mason says: "I understand that the ECB backs the plan." But the UK government has indicated its reluctance to sign up to closer EU ties. It prefers a body that only covers banks in the 17-member eurozone. However it would support a strengthened single market in financial services for all 27 EU states. The UK could not be forced to sign up, it can opt out, our Brussels correspondent Matthew Price said. "But if a significant number of countries press ahead without the UK on another major European issue, Britain could be left on the sidelines," he said. Governments in the UK, Belgium and other EU states have been criticised for spending large sums of taxpayers money to rescue banks from insolvency. Many claim bank shareholders reaped the gains during profitable years whilst taxpayers have been left to cover the losses from the financial crisis. I'm frightened if I imagine that we could continue the way we have been. Mr Barroso's plan would create a bank rescue fund from levies on financial institutions across the EU, effectively reducing company profits and shareholder dividends. This could also remove the possibility of one set of taxpayers, for example, in Germany, having to bail out savers in another country such as Spain. Deutsche Bank's co-chief executive Juergen Fitschen welcomed a more consistent approach to European bank regulation across the region. "I'm frightened if I imagine that we could continue the way we have been," Mr Fitschen said. Many European banks have made losses from lending to over-stretched firms and households. Many also risk huge losses from lending money to highly indebted governments such as Greece via the bond markets.